I've been having a go with the experimental web browser on my Kindle Paperwhite. I was initially put off because I found it very fiddly to use, but I'm getting more used to it now, and I've also found a number of resources that make the experience more bearable. The Kindle Paperwhite is not the best web-enabled mobile device around, but the WebKit-based browser is workable at a pinch (a bit like the ZX81 of personal computers), if you're away from home, at a public wifi hotspot, or if you just want to get away from your desktop and have not been physically or psychologically chained to your desk. I don't think it's advisable to use the Kindle Paperwhite's experimental web browser for really sensitive or important work, such as online banking. One thing that made a huge difference, at least for me with my fat fingers, was to buy myself a stylus from Amazon (a pen-like device with a soft rubber tip). 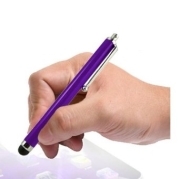 The one I got was the "Wayzon Purple High Capacitive Soft Rubber Tip Touch Screen Stylus Pen Suitable For Amazon Kindle Paperwhite Tablet" at £2.45, but there are many others to choose from. You may prefer one with a finer, less blunt tip. The stylus is fine for tapping on the keyboard, on hyperlinks and on buttons, though there are times when you have to zoom in to the web page content to pick out one closely-spaced link or button from the next. Clusters of social media sharing buttons are the worst, or buttons right at the edge of the screen. These styluses (or styli) have a soft rubber tip, so I'd advise that you use them for tapping and use your fingers for swiping and scrolling, if you want your stylus to last. You'll get best results if you sharply tap the screen with your finger or stylus, rather than push. And when typing, allow a little time for key taps to register, as the Kindle's response to touch can be a bit sluggish. One major omission is that on the Kindle Paperwhite there is no way you can select text on a web page and no means of copying and pasting text. There are circuitous workarounds, however. You can, for example, go to Scribz.net on a desktop machine, create notepad pages containing web site addresses (URLs), then visit Scribz.net on your Kindle and merrily click on the hyperlinks to launch the web pages in the Kindle's web browser. Needless to say, the experimental web browser does not allow you to open new pages in tabs and this almost-essential feature of modern browsers will be missed. The back button also doesn't return you to the same position in the previous web page, but back to the top of the page, which is especially frustrating on web pages that are frequently updated, like Twitter. Another omission is that you can only use the Kindle Paperwhite's web browser in portrait mode, whereas you can view your books in either portrait or landscape mode. If you could view web pages in landscape mode, there'd be more room on-screen for larger fonts and images. Some web sites won't work if they involve essential pop-up windows, depending on the code used to generate the pop-ups. For example, on this blogspot page, I can click on the Twitter icon and tweet about a post, but when I click on the Facebook icon to share a post, nothing happens. There's a workaround for that, by the way, under "Facebook", using the Selective Tweets app for Facebook. The Kindle Paperwhite's browser cannot handle flash videos such as YouTube, but that would be too much to expect, really; animated graphics flicker annoyingly; and there is no audio. If there were arrow keys on the on-screen keyboard, this would make it easier to position the text cursor to correct inevitable typos. Even with a stylus, it's hard to accurately position the cursor. When you go back to your Kindle and log in again, it will take you to the book, page or web site you were last at. You may find it better when you quit the web browser and leave your Kindle to either first go back to the Kindle's home page or to a web site that will load quickly, like Google. Sometimes if you're returned to a web page in this way, you may find that when you click on the menu to go to (say) your browser bookmarks, that the menu tries to open then immediately closes again. You may see a blank white menu background. To get around this, go back to the Kindle's home page, then again use the menu to return to the web browser. The menu should now work correctly. On certain news and blog sites that support the feature, if you navigate to a page containing a single article, select "Article Mode" from the drop down Kindle menu. You will then find the content better laid-out and far easier to read. However, you may find that some of the page's content has been stripped away for clarity, such as social media sharing buttons. So you may have to switch back to "Web Mode" to access these features. After googling a few terms like "kindle-friendly web sites", I've built up a list of useful online resources and added them to my bookmarks. Some of these were already bookmarked on the Kindle when it shipped. Some of the web sites have mobile versions; some successfully detect the Kindle's browser and serve up content suitable for a mobile; some you have to click on words like "mobile version"; and some (like blogspot/blogger) fail to recognize the Kindle's web browser as on a mobile device, serve up the desktop version of their web site and require a bit of work zooming in and out of on-screen content. The latter are best avoided, where possible. In the Kindle's web browser address bar, you don't have to enter "http://". For http://www.amazon.co.uk/ just enter "www.amazon.co.uk/", For http://en.wikipedia.org/ just enter "en.wikipedia.org/". The vast majority of web sites can handle a missing trailing slash, too. The Amazon web site comes pre-bookmarked with the web site which serves your geographical region. As you might expect, it correctly detects the Kindle web browser user agent and serves up Kindle-friendly mobile content. AOL Reader allows you to subscribe to one or more RSS news feeds and read the news items. See What is RSS? for more information. Many people have used Google Reader, but unfortunately that is no longer available. There is also a useful Windows desktop application worth looking at: FeedReader. The layout of Feedreader is similar to that of the email client Outlook Express (now Windows Mail). AOL Reader is not optimized for mobile browsers, so you'll have to play with the different layout settings and also zoom in and out. With that in mind, it's probably not a good idea to use 20 or more news feeds as you might on a desktop machine, or you'll be inundated with unread news that you can't easily browse. Just pick 2 or 3, like the BBC home news, Guardian world news and Scientific American for science news (say). Even then, it will pull in hundreds of items of unread news when you first add these feeds. This BBC News web site (preceded with "m.") is tailored to mobile devices and it works well. By default it shows home news (ie UK news), but you can click on the button labelled "Sections" at the top RHS of the screen and select other topics, such as "Education" or "World", and you can bookmark these as well, or instead of "Home". The Bing search engine site (preceded with "m.") is tailored to mobile devices and it works well. Cantoni.mobi provides simple hyperlinks to categories of mobile web sites, such as "Business", "Entertainment" and "Information". This will save you a lot of laborious searching and typing. 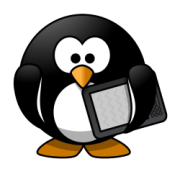 This site provides a few useful webpage-based applications for the Kindle. These are ideal for the Kindle Paperwhite as, unlike the Kindle Fire or a tablet, you can't install apps on the Paperwhite (at least not without jailbreaking the device, which is not something for the faint-hearted or inexperienced). Applications include a calculator, calendar, latest news feeds and thesaurus. There is a map application, but the Kindle really struggles to cope with this. This Facebook web site (preceded with "m.") is tailored to mobile devices. It's fine for checking and responding to recent posts, but the Facebook site is so "busy" and rich with content that you won't be able to really keep abreast of what's happening on the site as you can on a desktop machine. Though there's a clickable link at the top RHS of the page that reads "Search", nothing happens when you click this. Instead, scroll down to the very bottom of the page and you'll find a text box and a button labelled "Search". If you can't click on the button, then hit [Enter] on the on-screen keyboard at the end of your search text. Because search is a bit fiddly, it's probably a good idea to also bookmark Facebook pages and groups that you frequently use. Unlike the standard web site, posts and shares are not automatically pushed from the server to your feed in the browser, so you'll have to refresh the page to display new entries. If you install the Selective Tweets app in Facebook (using your desktop, not the Kindle, as it's a fiddly procedure), then if you send a tweet with the hashtag #fb at the very end of the tweet, Selective Tweets will post the tweet to your wall at Facebook. If you tweet a link to a web site, then in most cases, as well as the text, it will also post an image from the web page you've linked to. You may find this selective tweet facility useful because there are certain sites like Blogspot / Blogger where you can tweet a web page from your Kindle but can't share to Facebook (because of the code used to create a pop-up window that doesn't pop-up on your Kindle). Free Kindle Books offers thousands of free classic ebooks in Kindle-compatible MOBI and PRC formats. There are simple, clear hyperlinks to browse categories and authors and to download the books to your Kindle with the minimum of fuss. The Guardian web site detects the Kindle browser and serves Kindle-friendly content and works well. This section of The Guardian contains book-reviews and other book-related articles. If you want to check out other sections in the Guardian, come out of viewing an individual article to get to the Books home page, and click on icon showing three horizontal white bars in the top RHS of the screen (below the Kindle's own menu icon which has three horizontal black bars). Then click on "All sections" in the drop down menu. The Gmail web site (preceded with "m.") is tailored to mobile devices and it works well. To use Gmail, you'll need to open a Google account, or if you already have a Google account, you can add Gmail to it. It's well worth having a Google account: see the "Google" entry below. Goodreads will launch the desktop version of the site and, if you have automatic login using Facebook set up, you can wait while the system logs you in using your Facebook account. For this to work, you need to be already logged in to Facebook. I stay logged into Facebook on my Kindle all the time for this reason. Note that if you auto login with Facebook, then if you log out of Goodreads, this will also log you out of Facebook, which is a bit of a pain. At the top of the screen, you'll see the text "Mobile version available" and you really need to click on that to see more Kindle-friendly content. Again, the mobile site is fine for basic searching and browsing; but like Facebook and Twitter, if you have a number of friends and followers, you'll find the site too "busy" to really do much else on the Kindle. The Google internet search engine correctly detects the browser and serves up Kindle-friendly mobile content and it gives pretty quick access to a host of google services. It's worthwhile getting yourself a Google account, not only to access these services but also -- if you stay logged into Google on your Kindle -- you'll find that many other sites will allow you to log in using your Google account. Some allow you to log in with a Facebook or Twitter account, but I found this a bit hit and miss. Google Mobilizer is a proxy server. You enter a web address (URL) and the proxy server fetches the content and returns stripped-down, Kindle-friendly content. This is fine for browsing, but you may find that interacting with web pages, such as filling out forms, does not work via the proxy server. You'll also find that Google Mobilizer will split long pages into several parts, with (say) the main article content in one part and the calendar of blog posts or popular posts in another part. Google is not responsible for the content returned. I can't find a dedicated mobile web address for Google+. Navigate to the address above and you'll be taken to the Google+ desktop site. Then click on the hyperlink labelled "Continue to the mobile site." You'll need a Google account and you'll also be asked to verify the mobile access. Google+ will send a code via SMS to the mobile number associated with your Google account, and then you have to type that code into the Google+ web page. It helps if your mobile phone is switched on during this process. The JotMinder web site is optimized for mobile devices and works well. It's a cross-between Notepad and a wiki. It provides a cloud-based personal wiki where you can create simple pages and hyperlinks between them like Wikipedia. After logging in, you may encounter the occasional error (such as not finding the folders and documents you created earlier) and may need to refresh the page or log in again. KInstant provides a number of categorized links to Kindle-friendly online resources that might interest you, such as "News" and "Ebooks". You can also add (and save) a number of your own links for future use and easily click on these using the "go!" buttons. No registration is required. Scribz.net provides an online notepad for creating text documents. If you type in a web address, then if you come out of edit mode and view the note in read mode, the web address will show as a clickable hyperlink. Click on the link in your Kindle web browser and you'll be taken to the web page. You can edit and read the notes on a desktop machine and on other mobile devices you may have. Since there is no copy and paste facility in the web browser, then you may find this easier than laboriously typing out new web addresses in your Kindle's web browser. This site allows you to quickly create blog pages if you don't have a blog of your own. You'll find similar facilities online with Kindle-friendly web pages. The Pinterest web site (preceded with "m.") is tailored to mobile devices. It's a social media site where you can share images with followers and share them to other sites like Facebook and Twitter. Of course, as the Kindle Paperwhite does not have a colour display, the experience is a little lacking. The system is also sluggish, and of all the links on this page, this is the most marginally workable ... and it's the one site where you can't turn off the images to speed things up. You'll initially be taken to the desktop site. If you're logged into Facebook; if you have that set up to log you in, and if you're patient, you'll be auto-logged into Pinterest using the Facebook account. Then you'll be taken to the mobile site. The Pixel of Ink web site detects the Kindle and serves up a Kindle-friendly mobile version. The site lists free and cheap ebooks for the Kindle. Reading the Net is a proxy server powered by Google Mobilizer. You enter a web address (URL) and the proxy server fetches the content and returns stripped-down, Kindle-friendly content. This is fine for browsing, but you may find that interacting with web pages, such as filling out forms, does not work via the proxy server. You'll also find that Google Mobilizer will split long pages into several parts, with (say) the main article content in one part and the calendar of blog posts or popular posts in another part. Reading the Net is not responsible for the content returned. The Twitter mobile site is tailored to mobile devices and works well. Like Facebook, it's fine for checking and responding to recent tweets, but the site is so "busy" and rich in content that you need to work from a desktop machine to do any more than that. Like Facebook, scroll down to the very bottom of the page and you'll find a text box and a search button. If you can't click on the button, then hit [Enter] on the on-screen keyboard at the end of your search text. Unlike the standard web site, tweets are not automatically pushed from the server to the twitter feed in your browser, so you'll have to refresh the page to display new tweets. Web On Your Cell is a Kindle-friendly site. It contains simple hyperlinks to a number of resources in categories such as "Utilities", "Email" and "News". This will save you a lot of laborious searching and typing. The Wikipedia online encyclopedia correctly detects the browser and serves up Kindle-friendly mobile content. The WordNet Search web page works on a Kindle. It's an online dictionary and thesaurus fuelled by Princeton University's WordNet database. You may find that the font in the results is too small in Web Mode, and it's a lot more easy-reading in Article mode. There's a very useful offline Windows desktop application, WordWeb that also uses the WordNet database. The Yahoo! site (preceded with "m.") is tailored to mobile devices and it works well. You'll need a Yahoo! account and you'll also be asked to verify the mobile access. Yahoo! will send a code via SMS to the mobile number associated with your Yahoo! account, and then you have to type that code into the Yahoo! web page. It helps if your mobile phone is switched on during this process. This yahoo! mail web site (preceded with "m.") is tailored to mobile devices and works well. You'll have to navigate to the site and bookmark it yourself, as parameters like region ("?.intl=gb") will need to use your own chosen geographical location. Very useful. I would add that I (and I think others) have had problems with the browser freezing or not appearing to work which, in my case, is sometimes due to poor Wifi connection even though the Wifi symbol shows full signal: this should not be trusted. I think the Paperwhite needs a really strong signal for the browser to work well which it does when I am close to the transmitter. Sorry, you can't add software or browser plugins like Flash on a Kindle Paperwhite. At least not unless you could root the device, which is complex and could easily brick the device. Besides which, the CPU wouldn't be up to playing videos. how do you get to your blog on pen.io once you have made one? also how do you play games on it?